I try not to project my tastes in jewellery onto my customers. Some people hate halos and others love them. Making something that they like is what it is all about. I made the halo engagement ring above in 2018. The main diamond is a .80 carat cushion cut diamond. 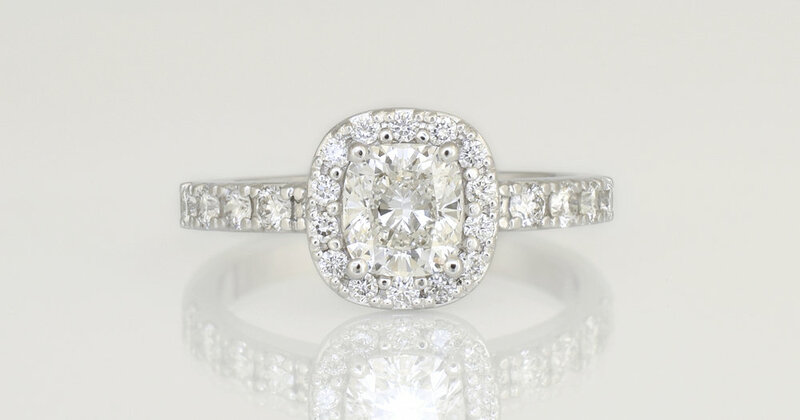 Personally I like the size of the diamonds around the halo that the customer chose. We all thought not too big and not too small, just right. larger diamonds in the halo - the same size as those in the band. another diamond was also added to each side of the band. I prefer the smaller diamonds in the halo to the larger but everyone is different and what I like is not important. Being able to create what my customers like is what it is all about. This ring was remade a third time after the proposal because the finger size was too far away to be effectively resized. You can read more in the second part of this article.